These Candy Crush Jelly Level 77 cheats and tips will help you beat Jelly Level 77 of Candy Crush. The objective of Candy Crush Jelly Level 77 is to crack the frosting and save three pufflers in 30 moves or less. 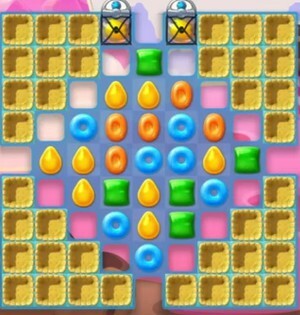 The main objective of Candy Crush Jelly Level 77 is to crack the frosting and save three pufflers in 30 moves or less. Due to the holes across the playing field, matching candies and accessing the pufflers becomes a bit hectic. However, you must clear the pie crusts so as to access the pufflers and save them to successfully complete Candy Crush Jelly Level 77. The most effective strategy of getting rid of the pies is by making use of special candies. Most importantly, create vertically special striped candies since after activation they will clear everything along their column. Clearing the pies also creates space where you can easily match more candies and create special candies important in helping you complete Candy Crush Jelly Level 77 on time.